Russ Smith is the founder of SOAR Youth ministries and a Kaleo who has brought kids to Kids Across America for twenty years. Two powerful questions led him to cross paths with Kids Across America and ultimately changed his life forever. One question happened when he ran a 10K. He could barely feel his legs as he ran a seven-minute mile pace in the race. As his friend ran beside him, they kept each other’s minds off the grueling run by asking questions. One particular question weighed down Russ’ thoughts: how long have you had a personal relationship with Jesus. Russ did not know. He had never thought much about a personal relationship with a living God. He read the Bible and went earnestly to church on Sundays, and Russ considered himself a religious, good, and moral person. But now that the question presented itself before him, he realized he had never repented of his sins or trusted in the saving power of Jesus. In that moment, Russ allowed God to charge a defibrillator and resuscitate him. As physically dead as he felt after running the race, Mr. Smith was now a regenerated and spiritually alive man. The second question was asked when Mr. Smith was in an unfortunate boating accident. Russ was enjoying a day on the lake with friends. While driving, Russ turned around to check on his friend that had fallen in the boat. In that split second, Mr. Smith collided with a comber. He was immediately ejected out of the boat and plunged into the lake. When he surfaced, Mr. Smith noticed that his friend was in the water, too. They both seemed to be fine, but the unmanned boat was circling toward them like a great white shark. The propeller blades cut his friend’s arm, snipping off his wedding ring and tearing into flesh straight through the bone. Feeling helpless, Russ yelled as loudly as his lungs would permit. A nearby neighbor heard his cries for help and came to rescue them. As his friend was rushed to the emergency room, the second question came to Russ: God, is there is something you want me to do? If so, what is it? His answer came from an unexpected source: the classic 90s movie The Mighty Ducks. The film follows the story of a lawyer who reluctantly coaches a misfit hockey team. But instead of hockey, God called Russ to coach soccer. 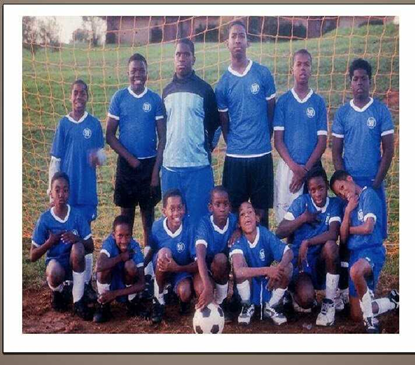 He organized a soccer team that became an overnight success and kids could not wait to be part of his program. The success was great, but it began to take its toll on Mr. Smith as he grew tired of the routine and busyness of it all. One day, the boys on the soccer team did not show up for practice. Frustrated, Russ retreated to his car and sat in his car in the parking lot waiting. Why was he even coaching soccer? He didn’t feel qualified, and he was confused why God would choose to keep using him. He wasn’t a social worker or a counselor, and it’s not like there weren’t better people than him for the job. A Bible lay in the passenger seat. Mr. Smith picked it up, randomly fluttered through it, and landed on Matthew 18:10. “See that you do not despise one of these little ones. For I tell you that their angels in heaven always see the face of my Father in heaven.” The words on the page were like a splash of cold water to Russ’ face. He shook with conviction. God had encouraged him, and he knew what to do. The boys had missed practice because they were competing in a championship basketball game. Russ turned on his car’s engine and drove to the rec center to watch them play. The parking lot was nearly empty—only four cars, and two were police vehicles. This was the championship game, right? He went into the center to watch the game and found a seat on the bleachers. Someone sat down beside him. It was one of his boys who had wandered over to keep him company. Soon, another one of his soccer players joined them. They were waiting for their turn to play in the game, but while they waited, they wanted to wait with their coach, Russ. The boys didn’t say anything, but their presence was a reminder that Russ had an impact, and his impact mattered. As Russ watched the game, he thought about his next steps. The kids didn’t necessarily need more sports teams, they needed support. He wanted to see kids strive in education and in life. He wanted them to soar beyond statistics and stereotypes, and, ultimately, he wanted them all to know the saving power of Jesus Christ. He knew his next step would be to start a ministry. Russ no longer saw Knoxville as a soccer field, but as a mission field where he could creatively share the gospel through education and recreational and spiritual means. Russ Smith created SOAR Youth Ministries. Mr. Smith recruited volunteers for his program by visiting local Sunday school classes and sharing the mission and vision of serving and reconciling the community. As a non-profit, the ministry serves over 1,000 youth supported by up to 300 volunteers in a 15,000 square foot facility located directly across the street from the local elementary school. The summer program consists of integrated reading, education, choir, and various clubs, but he wanted to do a little something else, too. That’s when he heard about Kids Across America. Russ visited a ministry in Memphis who just happened to be sending their youth to KAA, and Bruce Morgan, now KAA’s CEO, was across the hall recruiting staff. Then, Mr. Smith heard a radio where Focus on the Family was interviewing Joe White. This was a clear sign to him that Week 7 of the summer program, he would bring kids to camp. Twenty years later, the tradition continues as Russ Smith brings campers to Kids Across America each summer. SOAR is now a year-round program, and when the need arose, the city donated computers to the ministry. Russ has not regretted his calling. Instead, he his delighting in obedience to the Lord. Reminding himself of that moment in his car in the empty parking lot, Mr. Smith planted his mustard seed of faith in the ground, and God watered and fertilized the seed that is still producing growth twenty years later. It is amazing what God will do when people are just a little obedient. Camp is a place where you learn and grow, where you are able to build a solid foundation in Christ and learn what it means to have a life that is deeply rooted in truth and the word of God. For Edward Turner, his experience at Kids Across America was no different. Who is Edward “Ed” Turner you may ask? He is a reformer. Turner is devoted to make public education for the schools in Dallas run more effectively as he is running for Dallas Independent School District for district 9. He is currently and education organizer and Insurance broker in the Dallas area. Turner crafted his passion, after seeing his once thriving child hood community dwindle in population, forcing 4 schools to close down. He became a man of action. This change in his community propelled Turner to become one of the community leaders in his neighborhood and run for the district 9 school board. In the words of Turner, “Looking back, some of the things help grounded me.” One of those things being his experience at Kids Across America. 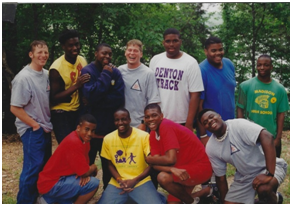 Turner attended Kids across America as a high school student in 1995-1998. Growing up as an inner city youth, he was involved in STEP Ministries. The ministry ventured out to the camp grounds located in Golden Missouri. During his time at KAA, Turner was able to be a part of Higher Ground. At camp, Turner was allowed to expand his body ability and discover his limited. He learn many things ranging from something as minute as learning how to do a back flip to something as eternal as seeing the vastness of God and lowliness of man. Turner, like an explorer, saw camp as a new world expecting exciting new adventures and looking forward to it each summer experience in the woods of Missouri. With every return, Turner kept coming back seeking more ways and opportunities to learn and grow in his faith. In the eyes of Turner, camp was a non-stop party. From the big welcome greeting that was given to each camper at camp to being cheered for in the bumblebee award as well as in competition. However, it was not the camp that celebrated him, but the people at camp that celebrated him. For Turner, camp was his release from the inner city, breaking away from the mundane cycles of life he was able experience life in a diverse exuberate community. At home, he was used to clothes line; but at camp, he experience zip lining and wire climbing—things that were foreign to him. Lessons from camp has stuck with him even today, such as, how to pray, life is a challenge by choice, think positively, be respectful and the importance of the Golden Rule. Ed Turner has been enrolled into the classroom of KAA and the curriculum was the gospel. Kids Across America showed him how to walk in unwavering faith and that God is with us when we are facing our fears. God knew what He was doing when He sent Emmanuel Williams, also known as Manny, back to Kids Across America. Manny already had been exposed to kamp for seven years: three years at KAA 1, three years at KAA 2, and one year at Higher Ground, a leadership training kamp. However, he felt the Lord banging on the door of his heart to return to kamp. When Manny envisioned his future, he never thought ministry lay at the end of the corridors of time. Nonetheless, as time unraveled, the Master Builder constructed a young man for ministry. In the beginning of summer 2018, Manny’s plans were a as shaky as an earthquake, but by the end of the summer, he rested on a solid foundation. He was hired as the Bridges Outreach programs director. Manny was built, constructed, and developed for the position. Along with other things in Manny’s life, KAA become a part of his process. This summer, Manny was hired as a counselor. Going above and beyond the job description, he shepherded counselors by making an effort to visit each cabin and pray for his fellow cabin mates. When it came to disciplining young men, he made a beeline to Biblical Manhood and the crucifixion of Jesus Christ. Manny was a fireball; a fire that could not be extinguished. Dancing in the dining hall, getting hype in football specialty with the kids, and stirring up the pot during the hype session, his fire needed no advertising. Everyone gathered around to watch him burn. It was a contagious, rampant epidemic. By the end of the first term, all the guy counselors voted him to win the I’m Third Award, a brass plaque given to kampers and staffers who have shown noble, valiant character in their words, actions, and deeds. During the first term staff party, Manny was fortunate to win it. The middle of summer, an opportunity presented itself to for Manny to be on the leadership team. He became the Athletic Director. Manny was both surprised and humbled at the fortuity. Could he handle it? Was he ready? With each doubt that popped up in his mind, the peace of God was able to tackle each objection his brain threw out. A good God reassuring him. On Leadership, Manny realized that he was more behind the scenes. He was no longer on the center stage as a counselor but was now the stage manager that positioned the actors. Each day was show time! It was demanding work from waking up for early morning meetings and going to bed late, from creating elaborate schedules to making sure storage sheds were in order, enlightening kids through discipline, and verbalizing truth at K-Life and Church. Manny--a kamper, a counselor and now an Athletic Director on leadership--had discovered a new love for kamp in a different position. Meanwhile, a church in Kokomo, Indiana, was looking for a programs director. For years they were strictly looking for a KAA guy to fill the position. Avery Blue, the former director of KAA 2 and now the Regional Director for Development, suggested the position. Manny fit the bill.The position was a complete act of God, the profession that Manny fills today at Bridges is what he is called to do in life. Constructing relationships with kids and passionately sharing the gospel is what Manny was designed to do. Now he is more himself than ever before. Manny’s life has become a bridge that connects defected people to a good God. Building a life is a process. As any good engineer will admit, architecture takes planning and vision. The builder must cast a perfect vision that will identically match the blueprints. Through strategic planning, the result is a beautiful building that reflects the creator’s acumen, sublimity, and artisanship. Building a skyscraper is a slow process, but building a life is a process within itself. The Master Architecture knew what He was doing when He called Manny back to Kids Across America. Those years at kamp had become part of Manny’s process. A good God is using a little patch of land in southwest Missouri and a bunch of young people to make Himself known to generations-- and Manny was one of them. We interviewed Dr. Tracy Timberlake, business entrepreneur and YouTube sensation, who holds a doctorate in Organizational Leadership. An award-winning YouTube vlogger, Dr. Timberlake has turned her video making into a marketing strategy. As mastermind of her successful online business, she helps daydreamers level-up their marketing to build the business of their dreams. Tracy worked at KAA from 2003 through 2007. During those five years, she served as a counselor, created the fun of camp while on the Programs team, was an assistant director, and also Interim Director of Kids Across America 2. While Tracy held several different positions at KAA, all required her to empty herself in order to pour out to the campers. Each summer at Kids Across America gave Tracy a new lesson to learn. She was taught what it looked like to grow in her faith, how to be a modest servant, and the intricacies of being an engaging and charismatic leader. Like a sponge, Tracy absorbed all she was taught at camp, but her most important lesson learned was how to make her faith her own and live it out in her real life. Now, some of Dr. Timberlake’s KAA campers have become her own clients as they follow her on YouTube and see just how much she grew during her time on KAA’s staff. Campers have seen Tracy at her lowest and emptiest in the heat and servanthood of summertime, but can now see her flourish in her business. For Tracy, knowing her campers have seen her growth is not only encouraging in a professional way, but in a spiritual way as well. She made a priceless impact in the lives of campers as she walked out her genuine faith in servanthood. And now she can help those campers grow in their businesses, too. Dr. Timberlake took what she learned at camp and applied it to a lifetime ministry. Camp was an incubator that grew and sustained her relationship with Christ and gave her a personal responsibility to live out her faith on a regular basis. Camp matters. KAA is a place where kids can have fun for one week, and it’s also a place where summer staff can be radically changed by God in a short amount of time. So much of what is taught at camp is what God endeavors to teach us in our everyday lives. Dr. Timberlake has traveled all over the world, spoken on numerous platforms of influence, has achieved financial success, and has accumulated nearly 47,000 followers on social media, but there’s no place like KAA. Kids Across America is a place where a person’s faith will be stretched. Summer staff serve at such a level for their campers that they are broken, but always leave repaired, and wrung dry, but always leave refilled. Camp gets someone ready for real life. At KAA, we also share the Gospel in the midst of sports, and that Gospel changes the lives of campers who will go on to change the world. Just like Tracy.